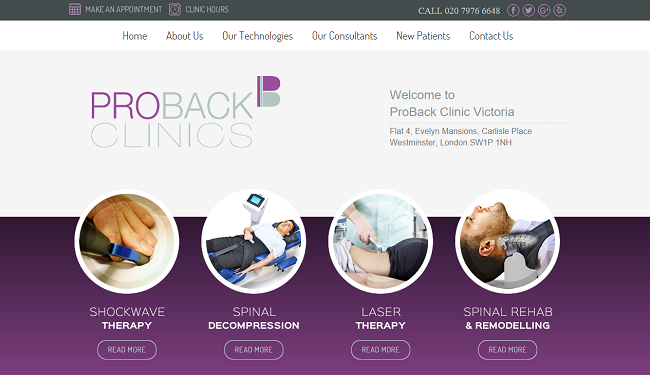 At the forefront of chiropractic technology, ProBack Clinic Victoria serves patients throughout the bustling Central London area. Backed by a multidisciplinary team of health practitioners, Dr. Christian Allard has been providing corrective chiropractic care since 1994. His rehabilitation clinic offers solutions to back pain and other debilitating spinal problems. Patients benefit from unique, tailor-made treatments using the most advanced chiropractic technology available. Involved in high-level sports from a young age, Dr. Allard suffered several injuries, leading to back stiffness, shoulder problems, and decreased energy levels. His journey toward wellness wasn’t achieved through conventional medicine, but through chiropractic treatment. Throughout treatment, he quickly understood the body’s ability to self-heal. “Healing is the most beautiful and amazing thing a person can experience,” Dr. Allard said of his profession. In a content interview for their new website, we learned about the passion that drives the ProBack Clinic team. As a premium Perfect Patients client, ProBack Clinic received a custom website featuring professionally-written content and a mobile-friendly design. In a phone interview with the team, Dr. Allard’s voice and vision for his clinic was evident and is illustrated throughout his new website.